Every entrepreneur knows that in order to gain success, a strategic plan adapted to the external environment is required. However, not all managers actually know how to create one. Fortunately, there are lots of helpful techniques, tools, formulas that you can use as a template. But which of them should you choose? That’s the question we’re aiming to answer today. No matter which stage of strategy development you are in, we suggest you to tackle the basics first. SWOT analysis serves as a bright example of a classic strategic planning technique. In our rapidly-developing world you can easily get lost in daily routine and miss some non-obvious issues of your business. This is where SWOT analysis gets indispensable. It becomes more than just a planning technique, it also gives you an opportunity to get a bird’s eye view of your business. So before adding a Conduct SWOT analysis task to your Gantt chart in Roadmap Planner, let’s answer the whats and whys of this topic. For the first time this acronym was used by professor Kenneth Andrews in 1963 in the context of a conference devoted to business policy problems. Then, in 1965, four academics from Harvard suggested to use the SWOT analysis model for developing business strategy. At that time it was named LCAG after the first letters of the authors’ surnames (Leraned, Christensen, Andrews, Guth). 55 years later SWOT analysis still retains its relevance. 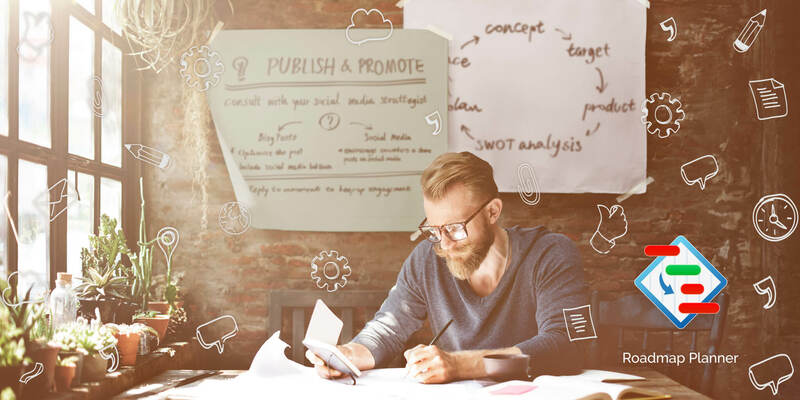 In a nutshell, it is a strategy planning technique which helps you assess the internal and external factors that are inherently linked to your business. The acronym SWOT stands for Strengths, Weaknesses, Opportunities, and Threats. Typically, the technique manifests in the form of a matrix, which is exactly what we will observe in this piece. Universality. You can use SWOT analysis for any organizational level of your company – a whole business, a department, a team, and even for self development. Simplicity. You only need logic and basic business skills in order to conduct a SWOT analysis right. Even just discussing all of the model components with your team can reveal some insights. It is widely known to be among the simplest analysis models. Cheapness. Since any of your managers can undertake SWOT analysis within their competence, it won’t cost you nothing except regular salary. You don’t have to hire additional specialists or pay for professional analytical services. So how to conduct a SWOT analysis? In order to figure this out, we’ll delve deeply into each part of the technique. At the end of the article we’ll visualize the whole matrix and introduce in it the questions you have to answer during the analysis. Taking Advantage of Strengths. Strengths are the positive factors that are internal to your company. These are the attributes that you can influence and should build on. For instance, express delivery of your products can definitely be your strength that you can use. Also, filling the Strengths box with the competitive advantages that you are aware of can also give insights on some non-obvious edges of your business. Reducing Weaknesses. Weaknesses are the negative factors that are internal to your company. You can influence these, too. Basically, these are all of the disadvantages that your company has. 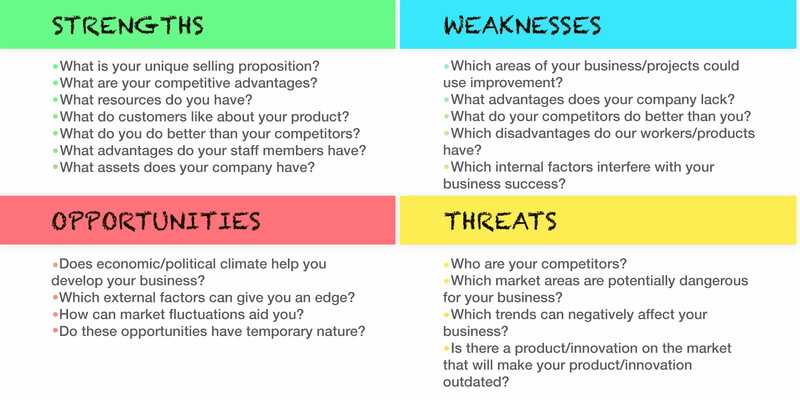 SWOT analysis helps you to identify your business’ shortcomings and be realistic about them. You have to minimize these factors before they become a real problem. An inadequacy of staff resources can serve as an example of a business weakness. Exploiting Opportunities. Opportunities are the positive factors that are external to your company. You can’t influence them, but you should utilize them. At this point you should identify them and figure how you can take advantage of them. For example, a lack of competitors on a new market segment can be your opportunity. Preventing Threats. Threats are the negative factors that are external to your company. Unfortunately, you can’t influence them, too. These factors could cause a number of problems to your company. That’s why you should avoid existing threats and prepare for potential ones. Changes in regulatory law will definitely be among such threats. Define the areas of business that you will analyze. You can choose any particular project, product, department, etc. Such approach will ensure the most complete analysis and minimize the number of missing/unnecessary factors. Feel the difference of factors. For instance, you can’t control the external ones, but should build your strategy considering them. Don’t try to change the opportunities and threats, but also don’t forget to take them into consideration. Analyze the strengths and weaknesses as if you were a buyer. You should remember that your clients probably don’t know all of your product’s advantages. As a result, some factors that you believe to be strengths could actually be your weaknesses when not articulated properly. That’s all for today! We hope this article helped you to understand what is SWOT analysis and why you need it. Our team also conducted SWOT analysis when we were creating our White Label VPN by KeepSolid, and so we’ve already solved all the obstacles that you can face. If you have some more questions, don’t be shy to ask them in the comments below.